A Son Is Lost Without His Mother. So Is A Country : Goats and Soda Dr. Ameyo Adadevoh is hailed as a hero in Nigeria. She and her team refused to release an Ebola patient who was demanding to leave the hospital. But her dedication came at a cost. She is one of the African health workers who caught Ebola and died. 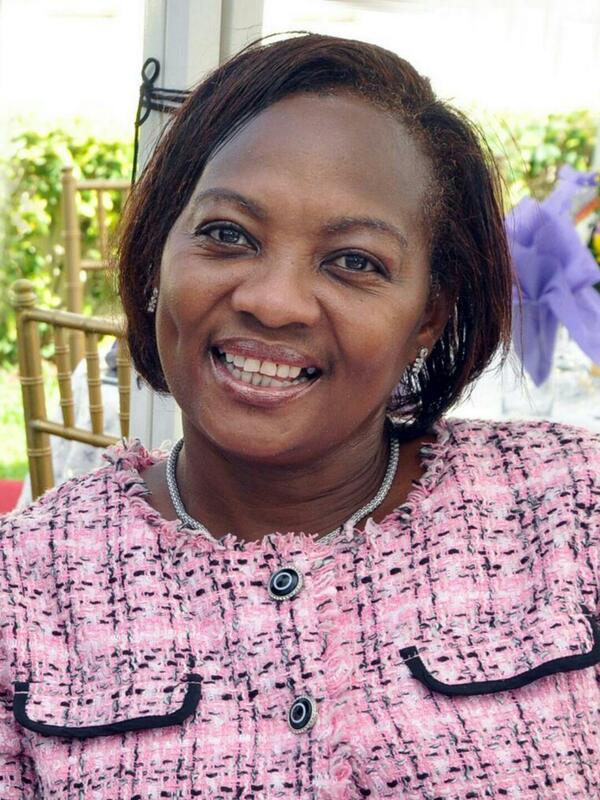 Dr. Ameyo Adadevoh was the head of First Consultants Medical Centre in Lagos, Nigeria. In July, Liberian-American Patrick Sawyer flew sick to the city from Monrovia, ended up at her clinic and turned out to have Ebola. He wanted to leave. Dr. Adadevoh and her team refused to let him go — if she had, he could have triggered a wide-scale epidemic in Lagos, a city of 20 million people. Instead, the outbreak was limited in Africa's most populous nation, and Nigeria was declared Ebola-free in October by the World Health Organization. 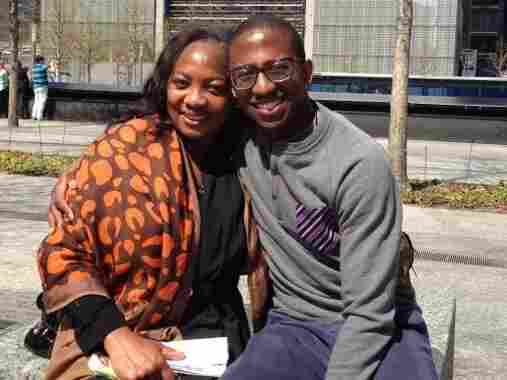 Adadevoh's only child, Bankole Cardoso, returned to Nigeria last year from the U.S. He had studied at Boston College, then worked in New York in financial services. But he missed his extended family, so he returned home to Nigeria and started a taxi service, EasyTaxi. Cardoso, who turned 26 while his mother was fighting Ebola, shared his thoughts about her life and death — and her legacy. How did Ebola come into your life? Once the Liberian national came into Nigeria and was rushed to my mother's hospital — of course this was the first time Nigeria had ever had Ebola. When you say your mother's hospital — Dr. Ameyo Adadevoh was the chief doctor at First Consultants Medical Centre in Lagos. Yes, she was there for 21 years. That's where I was born, that's where all my cousins were born, my friends were born. So many people go to that hospital because of her. She's synonymous with First Consultants Hospital. Upon seeing the patient, she was told that he was coming from Liberia, so she immediately suspected that he may have an infectious disease, because he was being treated for malaria at the time. And she noticed that [it] seemed as if he was bleeding on the surface of his skin. So that was the first time I ever heard her speak about Ebola. Dr. Adadevoh was the head of First Consultants Medical Centre in Lagos, Nigeria, which admitted the country's first Ebola case. All I remember her saying at the time — this was just her nature, never about herself — just I remember what she was saying was that he seemed scared, the patient. And so she was praying for him and telling him everything will be fine. Just like her normal self, as you would hear from anyone in Nigeria that has come across her, that she is completely selfless. She gives her all to all her patients. When someone is ill, she is happy to do an in-house call, she's happy to do anything to make sure they're fine. I remember her being so affected that he was so scared and worried about himself, when she had to tell him that she believes he has an infectious disease. Later on, I found out that when he was told he had an infectious disease, he went bananas, he was furious, and he demanded to be released from the hospital. At that point, and this I know as well, the Liberian government was calling her and pressuring her to release him, that he had come for an important meeting, an international conference in Calabar — in the eastern part of Nigeria. So they demanded for him to be released, citing that he was kidnapped by the hospital and that it's against his human rights to keep him there. They threatened her multiple times. She stood her ground. There was no way to let him go because he was putting the rest of Nigeria at risk if he left the hospital. By now your mother knew he had Ebola? On the Monday I believe they did the test. By the Tuesday or Wednesday it was confirmed. That there's no Ebola treatment unit? Precisely, and at the time there were messages going around Nigeria — avoid First Consultants Hospital, avoid Obalende — which is the area the hospital's in — because there's an Ebola patient there. She was concerned that the image and reputation of her hospital was being really damaged. The Liberian-American, Patrick Sawyer, died. Your mother then had to face a 21-day incubation period during which she could develop Ebola. When she fell ill herself, it was more my dad noticing. Normally she's an extremely active person. But one Saturday she seemed to be just taking her time, not really her normal self. So he suspected and we spoke, and she says she feels OK. When she didn't go to work on Monday and Tuesday is when she started to feel ill.
She didn't want to go into the isolation unit. Because when the Liberian national was at her hospital, I remember she used the world "uninhabitable." That that place was uninhabitable [the isolation unit that was being made ready by the health authorities]. Eventually, two days later, an ambulance came and we went to the isolation unit. The WHO doctor said he has dealt with hundreds of Ebola patients. In every five, two walk away, two have to be managed, one dies. And so he said that, in this condition, where he was working with bare health bones, understaffed, he was really battling and it's going to be a tough situation. Then the doctor was speaking to her, and after, he told us he suspects she has this disease. Of course at that point, I completely lost it, but I spoke to her and she was like, "Do not worry, this thing is not going to kill me." This is someone whose morale is never low. Even then her morale was not low. She is such a fighter. How was she responding in those first days? Suddenly, every day seemed to be getting worse and worse, so [the doctor] told us to prepare ourselves for what was to come. Five days later, she was still there. And things seemed to be getting better, perhaps. And [the doctor], for the first time he had something to say — maybe it could be neurological damage at the end of the day. This was probably day eight or nine. This was my birthday. The next day, we come expecting some more positive news, and that day the story just changes. He says it will be a matter of time. Until you lost your mother? Were you able to digest that? Of course not. My dad was able to comfort me, but I was lost completely. Losing a mother is tough in any circumstances, but losing her after she had tried to fight for the life of a patient suffering from Ebola, losing her to Ebola — that must have been devastating. Yes, completely. Devastating doesn't come close or even cover it. Anger, confusion — they're probably the two most forceful feelings I had. The fact that your mother is hailed as a hero — does that help? It was difficult at the beginning as we began to grieve. Her picture was everywhere, in the newspapers, on television, on social media. But now it helps in the sense that people are offering genuine support. This came from our nucleus of family and friends to begin with. But then after that, it has become even bigger. And so, I was comforted by people I know and now I'm being comforted by people I don't even know. What do they say about your mother? That your mother was great, she did this for our country. She really made a difference — an impact. She's a heroine. That's what's intriguing to me now, to hear different stories from different people. [They say] "she treated my grandfather, she treated my mother, she treated me, she treated my children. She treated four generations of our family". And you hear that from so many different people. That all helps. How old was your mother? She was 57. A lot of people that knew her — her patients and those that knew her outside of the hospital — were very surprised. They thought she was 40 or something. She had a very young personality. She took care of herself. She was too young. Fifty-seven. And you must be thinking, I'm glad I came home, back home to Nigeria? Things happen in mysterious ways, right? There I was in New York, comfortable. No reason really to come back. But there was this feeling inside me that I wanted to be home because of the family. That's where I belong. Thank God I did come back. But also, at times, I think if I was there, she would have visited me or maybe she wouldn't have been here. Is it lonely in the house without your mother? It's definitely not the same. Every household connected to our family feels the same. There's just something missing. Because, like I mentioned, she was this special bond between every single one of us. She just had this special relationship with everybody. How will you memorialize your mother? It's a health fund set up to improve the Nigerian healthcare system by working with institutions on a community level and by improving healthcare across Nigeria. Because the national health infrastructure is poor. Exactly and also because that is what she loved to do. She was in healthcare her whole life. Her father was a doctor, a professor. He opened the Infectious Diseases hospital in Nigeria which is where my mother passed. He was a renowned doctor as well. Her family is full of doctors. This is what she loved to do. She could be on holiday — anywhere, but she still attended to patients. She would do anything for patients. So to memorialize her, we want to continue impacting healthcare in Nigeria — giving people trust and faith in Nigerian healthcare. What kind of projects will you take on? Still in discussion phase — healthcare system, infectious diseases, education. Focusing on those main areas. We've already received some Hazmat suits to distribute to Nigerian hospitals. The protective gear that those who are fighting Ebola wear, to keep safe. Even other infectious diseases. It's important that Nigeria be prepared for all infectious diseases. Nigeria often gets a very bad press: Boko Haram, the missing kidnapped schoolgirls, complaints that Nigeria should be superrich with its oil wealth and yet people are so poor, because of corruption. But on this first case of Ebola in Nigeria, your country is earning plaudits from all over the world for stopping the virus. Exactly. I read somewhere that Nigeria was ranked 107th out of 109 countries in terms of healthcare, by the WHO, in 2000. So the fact that we beat this is definitely something that we had no divine right to do. I think people are shocked that Nigeria could pull off something like that. This has shown that, within our own country we can take control. We didn't need, really, outside help out of this situation. I really believe my generation is inspired by that. Your mother would be pleased to hear that. She will be. The last thing she said to me was that she was proud of me. I feel still incredibly connected to her, despite the fact that she's not here. So she's continuing to inspire you? Definitely. Absolutely. It's strange because, of course, there are times where I feel that she's still around. But then I'm like, "Don't be silly". But there are really times when I feel she is working her magic how she used to do. Did your mother discuss with you how she may have become infected with Ebola? There have been different theories that I heard from the hospital. That she touched an [intravenous fluid] drip bag. I read in places that she had pushed the man — but that's not true, because my mum was small and he was a big guy! She always maintained that she never had contact with him directly. So she claimed that it was a mystery how she got this. Was faith a part of Dr. Adadevoh's life? Hugely a part of my mother's life and mine through her. She was an incredibly spiritual person. Her faith was incredibly strong. And so we'd go to church together and things like that. She would actually call in priests and pastors to pay last rites to her patients that were not going to make it. And she had such a strong belief. Her last words were "Blood of Jesus," according to the doctor. You say she was incredibly energetic and always up and about. Do you think she gave up? Absolutely not. The doctors — they kept saying she is a fighter, so she's going to pull through. Giving up — it just doesn't exist for her.